One will frequently have several risk analysis models within an individual project. Each model will usually go through several different versions as the project develops, and for each model one might run several different analyses. The ModelRisk Library Projects tab is designed to help make organization of all these files much easier, and has the added benefit of providing a back-up facility in which you can quickly collate a project’s files into one folder and export. In order for a model to be added to a project it must be loaded into Excel first. This is because ModelRisk will add some information to the Excel file in order to identify it with a project. 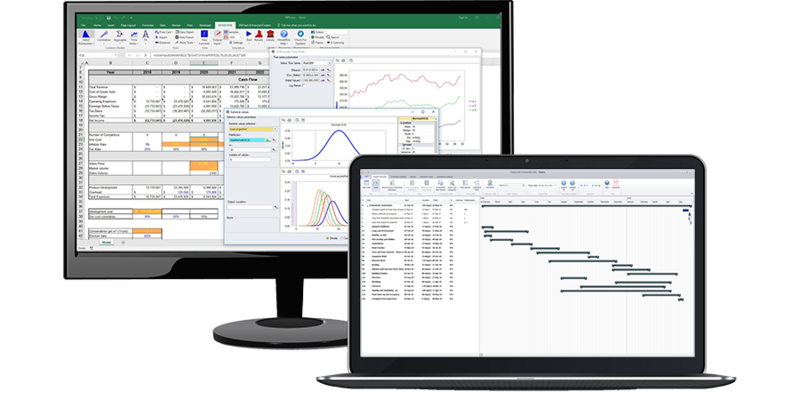 Once a model has been added to the project it can be loaded at any time into Excel by double-clicking the icon in the ModelRisk Library’s Projects tab. One can then run a simulation on the model and save the simulation results by adding them to the Library by selecting the model and clicking . The saved simulation results can be retrieved at any time by double-clicking the Library entry, and does not require reloading of the model. Models usually go through an iterative process of development, where content is added or changed. It is good practice to save versions of the model as it progresses. It allows one to review the effect on results and to go back to previous versions where an error has occurred. New versions of a model are also often created to explore different scenarios. ModelRisk allows one to save different versions of a model during its evolution. When you use a model that is already registered as part of the Library and make changes to it, on quitting the model ModelRisk will ask whether you wish to overwrite the registration in the Library or save it as a new version of the registered model. Your company may have a number of assumptions that it wishes to be used across all models. For example, there might be an official company forecast of oil or steel prices, exchange rates or the cost of some product you manufacture. These official assumptions may be fixed values (deterministic) or include uncertainty (stochastic). The Assumptions tab within ModelRisk’s Library allows you to directly use these official assumptions within your model with a click of an icon. You can import any updates to the assumptions and future runs of your model will then be automatically updated. The assumption name and description can be any text, but it is useful to bear in mind that the assumption list can be ordered alphabetically by either of these fields. or simply some text, if required. One can copy an html address into the ‘Assumption source’ field, in which case it will store the source as a hyperlink as shown for the second to fourth references in the screenshot above, or one can browse for a file location. Clicking OK then adds the assumption to the assumption list. Individual reference can be deleted by selecting the appropriate row and clicking . Assumptions can be edited by right-mouse clicking an entry and selecting ‘Edit this assumption’. Clicking the VoseLibAssumption hyperlink will automatically open the Assumptions tab of the Library and select this assumption. Clicking the hyperlink entry in the Source column will directly open the web page in your default browser. If the source is a file, clicking will open the file in the appropriate application. You may have a number of references that you’ve used in quantifying the variables within your model, that refer to some theory you are using, or that are pertinent to your model in any number of ways. The Reference within ModelRisk’s Library tab allows you to store references to documents or html addresses. Using the VoseLibReference function a reference can then be attached to a cell of your model, allowing one to quickly review the reasons behind certain values or assumptions. The reference name and description can be any text, but it is useful to bear in mind that the reference list can be ordered alphabetically by either of these fields. On can copy an html address into the ‘Reference source’ field, in which case it will store the source as a hyperlink as shown for the first two references in the screen shot above, or one can browse for a file location. ModelRisk then adds the reference to the reference list. Individual reference can be deleted by selecting the appropriate row and clicking . Clicking the VoseLibReference hyperlink will automatically open the References tab of the Library and select this reference.